5 Seconds of Summer (a.k.a. 5SOS) are an Australian rock band that that has been performing together since 2011. The group rose to prominence via their covers of pop and rock songs on YouTube. This cultivated the groups rabid fanbase of preteens which was only bolstered by their stint touring with One Direction on their “Take Me Home Tour”. The song "Good Girls” was the band’s fourth single off their debut album, and was released in October of 2014. The music video was released just a few days later, and has amassed nearly 57 million views on YouTube. The song is a pop punk belter that features a driving guitar riff and some in-your-face drums that give it a similar sound to groups like Sum 41 and Blink 182. The lyrics all lead back to a line contained in the chorus: “Good girls are bad girls that haven’t been caught”. This is a play on the idea that everybody has secrets and a wild side, as the song goes on to paint a picture of the perfect “good” girl. However, the boy in the song soon finds out that she isn’t as good as you might believe, as she sneaks out and makes out with her boyfriend in the library. It’s a cute song while being fairly standard pop punk fair. The boys make their way through the all girls reform school. The music follows the band as they arrive at an all girls reformatory school. They come in under the guise that their music will lead to a quicker reformation of these bad girls, and the dean of the school says the line from the song, “Good girls are bad girls that haven’t been caught”. The band then turns the school on its head by performing the song, which has the exact opposite effect the dean desired. The girls at the school stage a breakout, and tear the place apart. 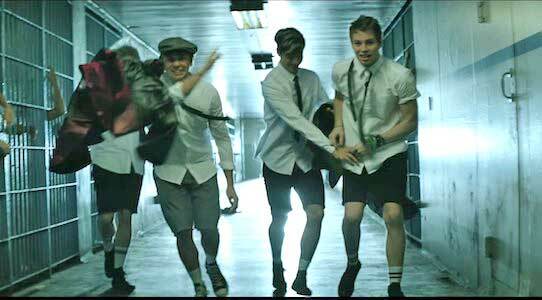 They end up locking up the dean and watching 5SOS play in front of the school. The band wears monochrome black high top chucks in the scene where they’re performing in front of the school, but drummer Ashton Irwin wears a classic pair of black and white high tops when the band first enters the school. The music video is the sort of good feeling, punk party video this genre of pop punk is known for, and it works well with the song’s lyrics. 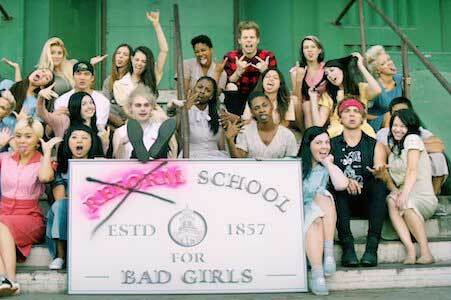 5SOS performs in front of the reform school, starting a riot in the process. Use the links below to get yourself a new pair of chucks to wear at reform school.